(Nanowerk News) An exotic form of carbon has been found to have an extra large nucleus, dwarfing even the nuclei of much heavier elements like copper and zinc, in experiments performed in a particle accelerator in Japan. The discovery is reported in the current issue of Physical Review Letters and highlighted with a Viewpoint by Kirby Kemper and Paul Cottle of Florida State University in the February 8 issue of Physics. Carbon-22 is now the heaviest observed Borromean nucleus. 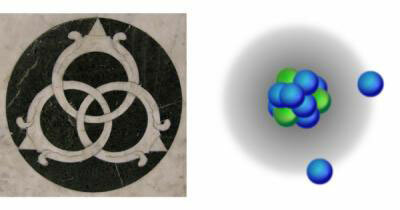 Borromean nuclei are named after the rings from the 15th century crest of the Borromeo family from Northern Italy. The rings are connected in such a way that the cutting of one ring results in the separation of all three. (Left) Marble representation of the Borromean rings, used as an emblem of Lorenzo de Medici in San Pancrazio, Florence. (Right) Schematic structure of 22C showing the two halo neutrons around a core. Removing any one element makes the entire structure unstable. Carbon-22, which has a nucleus comprised of 16 neutrons and 6 protons, is the heaviest atom yet discovered to exhibit a "halo nucleus." In such atoms, some of the particles that normally reside inside the nucleus move into orbits outside the nucleus, forming a halo of subatomic particles. Because atoms like carbon-22 are packed with an excessive number of neutrons, they're unstable and rapidly break apart to form lighter atoms, but they are more stable than scientists had previously expected. The extra stability is a surprise because the three particles-– two neutrons and a nucleus-– that form a halo nucleus interact in a way that is difficult for physicists to model due to the complicated mathematics necessary to describe so-called "three body" problems.